President Obama had just nominated him in April to be USDA’s Under Secretary for Research, Education, and Economics (REE). The Senate confirmed him on May 12. 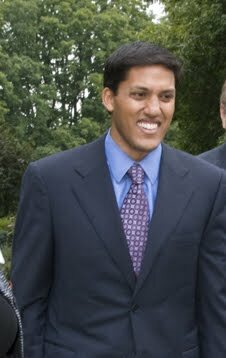 Today, the newsters are breaking all over the place reporting that Rajiv Shah will be the administration’s nominee for USAID Administrator. Shah was a health care policy advisor on the Gore 2000 presidential campaign and a member of Governor Ed Rendell’s (D-PA) transition committee on health. He is a co-founder of Health Systems Analytics and Project IMPACT for South Asian Americans. He also served as a policy aide in the British Parliament and worked at the World Health Organization. Originally from Detroit, Michigan, Shah earned his M.D. from the University of Pennsylvania Medical School and M.S. in health economics from the Wharton School, University of Pennsylvania. He is a graduate of the University of Michigan and the London School of Economics. In 2007, Shah was named a Young Global Leader by the World Economic Forum. Read more on this breaking news from Laura Rozen/Politico, Josh Rogin/The Cable, and Matthew Lee/AP. From AFSANET dated November 9: The AFSA Committee on Elections wishes to advise the AFSA membership that the recent 2009 Governing Board election has been challenged. The Committee on Elections had previously found one violation in the course of the campaign and had so notified the candidates. Three candidates filed complaints with the Department of Labor (DoL) alleging that other candidates or slates violated the Instructions to Candidates. The DoL conducted a thorough investigation and we are awaiting the results. If the DoL finds that violations occurred that could have impacted the outcome of the election, it may order that AFSA conduct a new election. The Committee will notify the membership accordingly once we have received a decision from the DoL. Such challenge must be received by July 15, 2009 and should be addressed to “Chair, AFSA Elections Committee” and mailed or delivered to either address stated above. The AFSA Elections Committee will respond in writing to the challenge within three months of receipt of the challenge. If the member is not satisfied with the AFSA Elections Committee’s response, the member may file a written complaint with the U.S. Department of Labor, Office of Labor-Management Standards. Such complaint must be received by the Department of Labor within one month of receipt of the Elections Committee’s response. The Labor-Management Reporting and Disclosure Act (LMRDA), establishes democratic standards for conducting regular elections of union officers and delegates who elect officers. These standards require use of a secret ballot, reasonable opportunity to nominate candidates and vote, mailed notice of election, and other safeguards to ensure a fair election. The LMRDA also gives union members who believe that a violation of the election provisions of the LMRDA or of the union’s constitution and bylaws has occurred the right to file a complaint with the Secretary of Labor. The Office of Labor-Management Standards (OLMS), an agency within the U.S. Department of Labor, is responsible for investigating these complaints and taking appropriate enforcement action, including supervising new elections, if warranted. The LMRDA requires that a member must first file an election protest with the union before filing a complaint with OLMS. The protest filed with the union must follow the procedures and time frames in the union’s constitution and bylaws. Protest procedures differ from one union to the next but generally include requirements for filing the protest in writing, filing within a specified time period, and following specified steps in the protest and appeal process. The requirement that a member must file a protest with the union before filing with OLMS gives the union a chance to look into the member’s allegations and to correct any problems which may have occurred in the nomination and election process. Therefore, it is important that you review your union’s current constitution and bylaws and follow the protest procedures carefully. Failure to comply with your union’s protest and appeals procedures may result in your complaint being dismissed. If OLMS determines that either no violation occurred or a violation(s) occurred but did not affect the election outcome, no further action is necessary and OLMS closes the case. A “statement of reasons,” explaining specifically why the case was closed, is sent to you, the local, and the national or international. The DOL guidelines appear pretty clear that the election protest be filed with the union first before complaint is filed with OLMS. Makes one wonder if the three complaints submitted to DOL had been previously submitted to AFSA. This is the first time I’ve heard of these. Have you heard about these three complaints previously? Of course, the real question at the back of our mind is really this – if a new election is ordered, how much more messy can it get given its contentiousness this past summer? 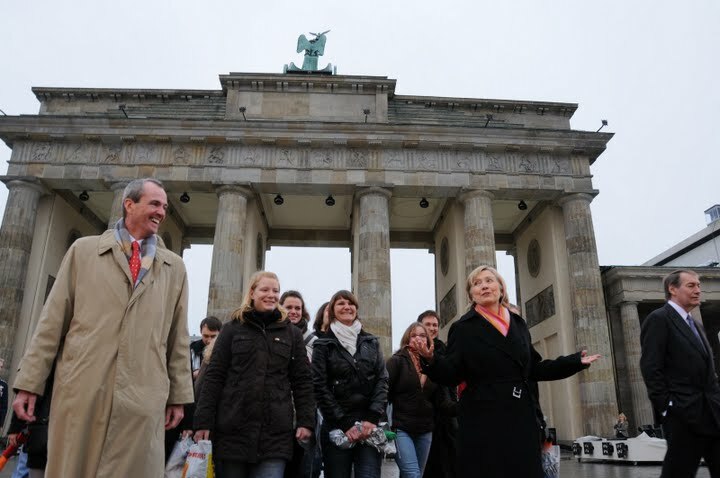 On the 20th anniversary of the fall of the Berlin Wall, U.S. Secretary of State Hillary Clinton met with 13 of the high school students from the eastern state of Brandenburg, who painted one of a thousand dominos that have been placed along the former border at the Brandenburg Gate. Below is Ambassador Philip Murphy with Secretary Clinton. November 9, 2009 (Photo from US Embassy Berlin). Click here for more photos from US Embassy Berlin. Yesterday, DOJ announced yet another guilty plea on the passport snooping case. This is the 8th person to plead guilty to illegally accessing passport files. How many more are coming down this way? An eighth individual pleaded guilty today to illegally accessing numerous confidential passport application files. Susan Holloman, 58, of Washington, pleaded guilty before U.S. Magistrate Judge Alan Kay in the District of Columbia to a one-count criminal information charging her with unauthorized computer access. Holloman is scheduled to be sentenced on Jan. 21, 2010. According to court documents, Holloman has worked full-time for the State Department since November 1980 as a file assistant in the Bureau of Consular Affairs. In pleading guilty, Holloman admitted that she had access to official State Department computer databases in the regular course of her job, including the Passport Information Electronic Records System (PIERS), which contains all imaged passport applications dating back to 1994. The imaged passport applications on PIERS contain, among other things, a photograph of the passport applicant as well as certain personal information including the applicant’s full name, date and place of birth, current address, telephone numbers, parent information, spouse’s name and emergency contact information. These confidential files are protected by the Privacy Act of 1974, and access by State Department employees is strictly limited to official government duties. Holloman admitted that between Feb. 13 and Dec. 5, 2007, she logged onto the PIERS database and repeatedly searched for and viewed the passport applications of 70 celebrities and their families, actors, professional athletes, musicians and other individuals identified in the press. Holloman admitted that she had no official government reason to access and view these passport applications, but that her sole purpose in accessing and viewing these passport applications was idle curiosity. Holloman is the eighth current or former State Department employee or contractor to plead guilty in this continuing investigation.